I have been very lucky this game season with the range of species that have fallen into my lap. Last post I told you all about the snipe I managed to get from my butcher Mark Frost. Well he’s done it again and has managed to hold of half a dozen beautiful woodcock, the larger cousin to the snipe; almost as elusive and certainly no less delicious! Another rare treat for the patrons of The Buttery. 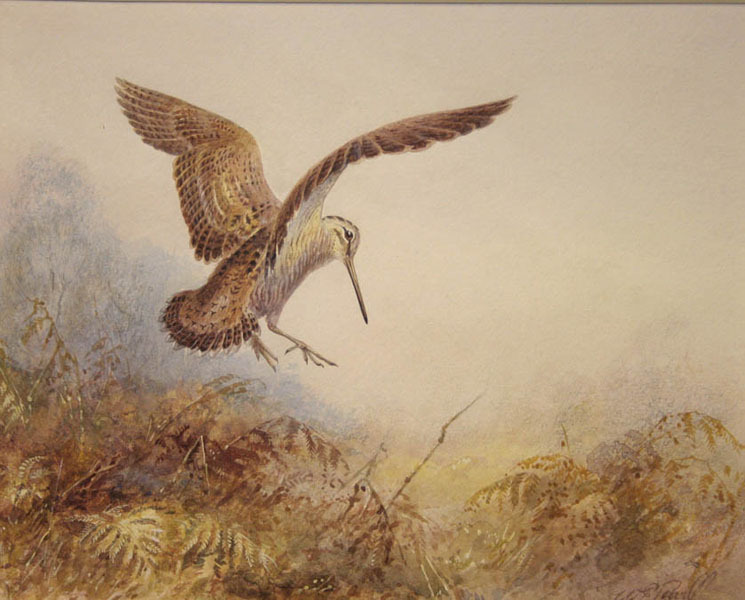 Woodcock and snipe are similar birds and likewise can be cooked in similar ways, so much of what can be said about cooking and eating snipe can be said about woodcock. Our second-smallest game bird is a mysterious little creature, spending most of its day hiding in the undergrowth in wooded areas. The only time you are likely to come across one is if you startle it during a walk in the woods, but even then you may just catch a glimpse one of skitting and zig-zagging toward another hiding place. Then, suddenly, usually around the full moon before Hallowe’en there is a huge influx of migratory woodcock, using Britain as an overwintering spot, often being first spotted on beaches, exhausted. Seeing the birds apparently come from nowhere in this fashion and at this time must have added to their already ethereal reputation. Having little understanding of migration, people thought woodcock went to the moon during spring and summer. Seeing them first on beaches made others believe that they hatched from mermaid’s purses (the desiccated egg cases of sharks). Reclusive and well-camouflaged, they only venture from their hiding places to hunt their prey at dusk; and it is for this reason that woodcock are rarely found in butcher’s shop windows. 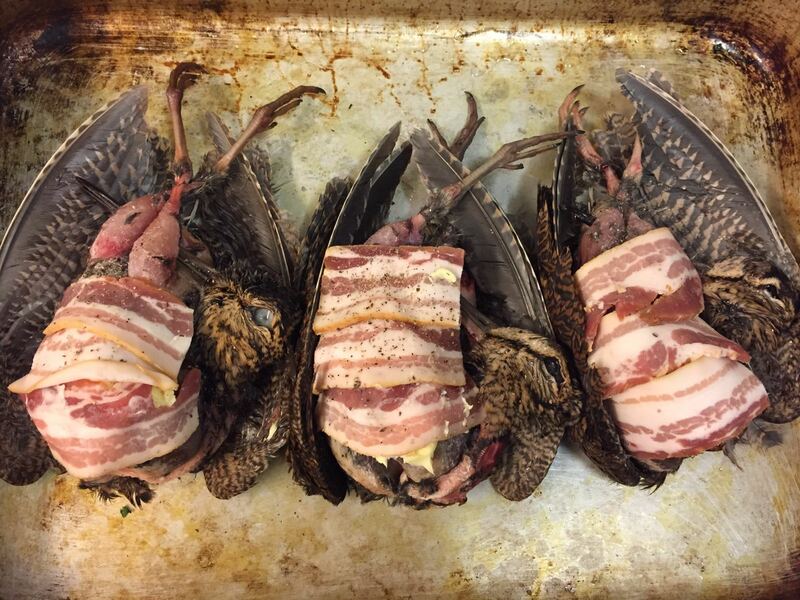 It’s a lucky shooter that manages to bag a few woodcock, and they rarely go further than the hunter’s kitchen. I’m lucky in that my butcher is also a shooter! 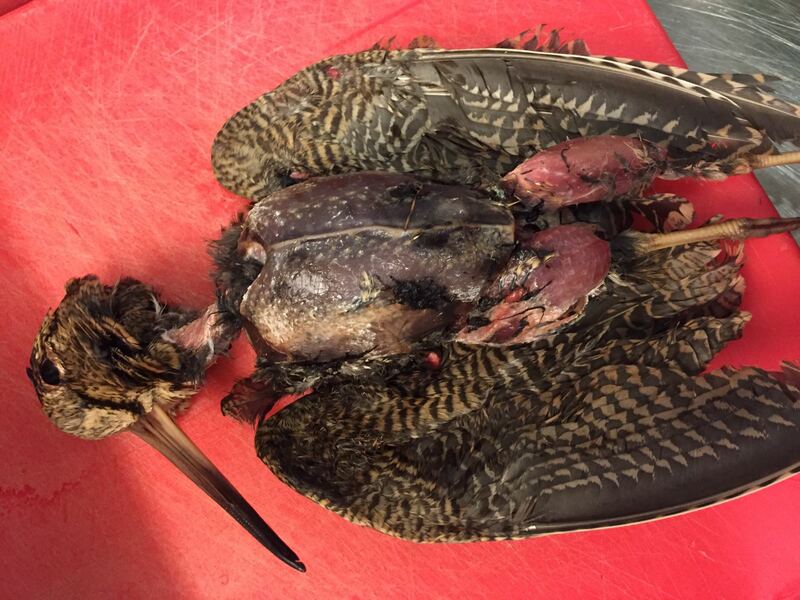 A treat almost as rare as snipe, it is absolutely delicious t traditionally roasted completely whole on a piece of toast, with just breast and leg feathers removed. The trail (i.e., the innards) are then scooped out and served upon the toast. Ortolan and plover are cooked in the same way (though it is now illegal to eat ortolan). Because they are eaten whole, they should not be hung for long, as those gamey aromas quickly turn into the aroma of decomposition. 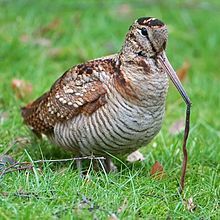 However, it is all personal taste – true gastronomes hang their woodcock or snipe by the feet until the innards of the birds start to drip through their bills. Woodcock were not as rare a treat as they are today where they can only be legally shot during the months when the country is teeming with them and can only be shot. Guns were not light enough to shoot woodcock with any accuracy or success and so night nets were set up that caught the birds in great numbers so they could be sent to market still alive. This practice is now illegal (though, unfortunately not in all other European countries). Woodcock are rarely found on sale, but I have spotted them in my butcher’s shop a couple of times in the last three or four years. I do remember seeing them once at a game stall in London’s Borough Market. Patience is a virtue and if you keep looking, you’ll eventually find one. On the open market, you’ll pay at the very least £15 per bird. Alternatively, make friends with a hunter, or ask if you can help in a local hunt. I have never done this, but would love to. Take a woodcocke, & reyse his legges and his wynges as an henne; this done, dyght the brayne.And here begynneth the feest from Pentecost unto mydsomer. As already mentioned, woodcock need not be drawn. You can pluck them, but be careful as they have very thin skins that are easily torn. If you are keeping the head on, remove the eyes and skin the head if you like. To draw the birds it is best to use some sharp scissors to make an incision. Use your first two fingers to loosen the innards and pull them out. Keep the tiny livers if you like. Drawing woodcock is easier compared to other small game birds such as partridge. See the post on snipe for more details. Smear butter over the breasts, season and cover with streaky bacon to prevent the bird from drying out in the oven. Roast for 20 to 25 minutes, depending upon how rare you want your bird. Slip the buttered toast under the bird for the final 10 minutes of roasting.